As we come to the end of "2017", like others years before, we need to take the time to remember our accomplishments, our disappointments and our future dreams. We need to remember our accomplishments so that we can see what we have done for ourselves this year. These accomplishments are what fuels our energy to continue the good work and move forward. Our disappointments are to be looked at as lessons to be learned and things that we failed at should be embraced. Out of our failures come strength, new growth, new directions and new hope. Our future dreams are accomplishment we wish to happen in the future. Dreams that need to be worked on and given life to. Future dreams are in the early development stage that has to be given nourishment to grow. That must be constantly worked on in order to help it grow and move forward. It should never be something to give up on. Also, looking at our life in "2017" Who would you say left a footprint on your heart and whose heart did you leave a footprint on? A footprint is something you did for someone else that you are remembered for. Did you help someone stand tall for themselves and appreciate their accomplishments? Did you opened the heart of another person and help them realized what happiness is without pain? Did someone make you smile and laugh until it hurt? Did someone help you to find out what LOVE is? Take the time to remember the happiness throughout the year! Let us all take a moment of this year that we are about to say goodbye to and look at what happy notes we came across in "2017". Take the time before we start a new adventure in a new year, let's not forget what made us cry and the pain we experienced in order to expose us to love and hope for the future. Yes we made mistakes and we always will, but out of those mistakes we must look at what we have learned. A life without pain doesn't teach you to be grateful for the happiness. When we go through life trying not to fall and get hurt we forget how to live and love. Stop! Look! and Learn what 365 days has done for you. Who made you smile more this year or just for a part of the year, who taught you to giggle at yourself, who opened you up to believe in yourself, who picked you up and brushed you off and found a gem in you. Life passes so quickly that sometime the only thing we remember is the pain and forget the joy that does come out of the pain. As we reach the end of this year and hope we can carry over the happy days from this year just remember they are now memories to carry over into the new year. Once the new year begins so does new adventures which will turn into memories. So, at the end of "2018" we will have more memories to carry over. As we all approach this special day called Christmas we begin to run around, buying gifts, sending cards and mailing packages. We try to make sure that everything is covered from mailing packages, to all the fixings for the Christmas dinner. With all the rushing around trying to get everything done we may have forgotten the secret of the holiday. The secret of Christmas is giving, love and appreciation. The thing that can't be bought and packaged away is sharing ourselves with each other. Giving is something we should be doing all year, not gifts but of ourselves. Being there when someone needs a helping hand. Giving of your time is the best gift you can give another individual. Love a word that in itself can't be explained. It is a feeling that runs so deep that you feel as if you could and would do anything for some one you love. this feeling should be shared throughout the year, not only at Christmastime. Appreciation is a way to express your recognition of a persons effort. Not just because they gave you a gift but because the put their best foot forward. Christmas is not just opening presents but it is opening hearts. I hope this year when you give the gift of love that you will practice spreading love and appreciation all year long. Take the time to appreciate and love each other at this time and always. Let's talk about what "Turning the Page" means. When one turns the page of their life, that means they have moved forward. You begin reading the new chapter of your life. When you turn the page of your life, it doesn't mean that you are turning your back on people or things. It means that you're just moving forward, in order to see what the next chapter of your life looks like. You can't start the net chapter of your life if you keep re-reading the same chapter. There comes a time in your life when you have to choose between turning the page or just closing the book and staying in the same spot, never moving forward. Life is a book with many chapter, but if you never turn the page and read the next chapter you will never know what the next chapter has in store for you. In order words, what your life is all about. Forgiveness is another form of moving forward and turning to a new chapter. 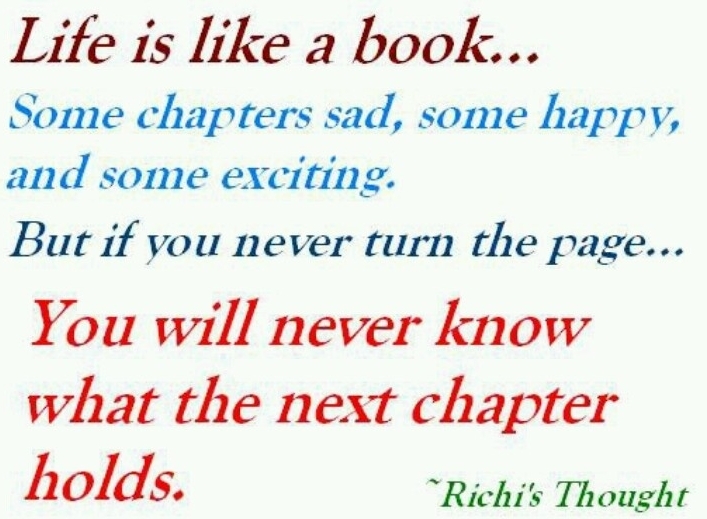 Every chapter has a new beginning and a different ending. For different reasons we get stuck in a chapter because it is to painful to turn the page. Sometimes in your life someone can offer you a helping hand in turning the page. Just remember every chapter of your life is different and by not turning the page will keep you where you are unable to grow and reach your life goal. So, believe in yourself and push forward to another phase of your life. Making small steps is how you reach big goals. We all go through hardships doing our lifetime. Sometimes we feel we have more downs than ups and can only focus on the downs. The reason for this is because the disappointments and upsets hurts and anything that causes pain will be remembered. Pain is something that gets attention and pain can sometime make a positive change in your life. Pain holds you in one spot, it doesn't allow you to grow and become a person of worth, it hinders you from focusing on the big picture. Pain can force you to make that step forward just to get in front of it. When you put a smile on your face and others, find a new adventure, extend a helping hand and start believing in yourself it will cause a positive change in your life. Fall, that time of the year, is when you should shed the negative vibe that's been following you around during the year. Take a look at your accomplishments, your growth, your well being, your hopes and dreams. When you make positive changes in your life you feel better and happier about your life and future. Remember all the good you have done in life and shared with others throughout the year. Think about how many lives you have changed by extending your kindness and knowledge to people in your life. 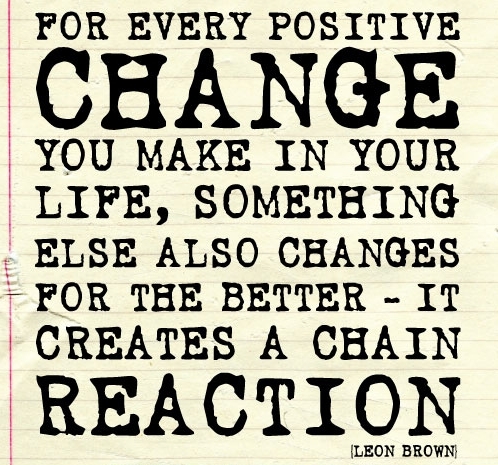 To start making positive changes in your life you must re-adjust your thoughts. Filter out the negativity and grab on to the happiness that is out their for you. Positive thoughts yields positive results. No matter how bad you think things are, the positive things you do for yourself and others is how to begin to heal and make positive changes in your life. In todays times it is so easy to express your emotions in an email, in a text or just a short tweet. The reason that it is so easy to say something in a written message is because you are not facing the individual. We are so abt to say how we feel in writing because the other person can't respond or interruption your feelings or thought process while you are just typing out your written emotions. The person reading the written message doesn't get to express their emotions. The one sending the message get to say what they want, whether the saying is true or not. You will never be able to disputed the words which were sent to you. They get to type their feelings and expression of how they feel and the person reading that mail doesn't get to react or correct anything, can't response or even have an opinion of what is being read. I believe that this is the worse way to communication any message unless it is a lesson plan. Communication is a two way street. In order for someone to respond to a written thought they would have to turn around and email, instant message or text back. By then the item they have read has be translated into their thoughts and their emotions. Whether the written item was right or wrong responding would have to be sent in writing also. Emotions by mail is the wrong way to express your thoughts to another individual. A person does that so that they won't have to hear your explanations or any reasons you need to express. Because they have said all THEY wanted to say in writing, a one sided conversation. it doesn't leave you any room to tell them how much you have accomplished, tell them about a special person you have included in your life, about how thankful you were for them guiding you in the right direction. For you to tell them how much you have grown with their guidance and thanking them for the great opportunity to succeed. It doesn't allow you to express to them your appreciation. It doesn't give you the opportunity to say thank you, If only they would have called! So, after that email is read and trashed, the words still linger in your mind leaving you with your success story untold. We all get so busy in our life that we miss those most precious moments of our days. Those happy moments that only last for a short time in our life. The times you spend with a love one, a friend, your children, a champion makes you feel happy and joyful and should be captured. How just for a moment you were in another place enjoying what you were doing at that time. Just allowing yourself to be free, no worries, no responsibilities. Just reliving that time of excitement and love. There is a lot that can happen in just a moment, that you would want to keep in your memory. In a moment a child is born, you fall in love, you discover life in a different form of existence. You want for nothing because in that moment you have everything. In a moment your world can be turned upside down. You realized as good as that feeling was it was just a moment in time. That moment can turn to tragedy in just a short time. It could change the feelings and emotions from joy to dismay. Your first bad event, a death, a heartbreak, a disagreement, a disappointment. That moment seems like a life time but it is just a moment in time. We all need to slow down and acknowledge those great moments in time. When you discover your first love, a fantastic kiss, a warm embrace, a kind jester, a sincere person, a new job, a new adventure. We should learn to appreciate those moments in time because as soon as it happens it is over. We should file those moments in our hearts to be referenced when thing go wrong. Giving us the ability to look for comfort within ourselves. We all have moments in time that are good and some bad, but it is up to us to capture and remember the good one. Don't waste your moments of pleasure on hate, madness and upsets. Embrace those happy times because you only have them for a moment. Always appreciate the good things you receive and good people you meet in that moment in time. We all try to keep our outer body firm and young looking. We work our mind by keeping the knowledge up to date. We exercise our body so that we can look good and continue to enjoy life's pleasures. We exercise our mind by learning new life events, reading and keeping up with new ways of communicating. But, what have you done for your inner self? Are you feeding your inner self with strength and encouragement? Are you conditioning your inner self with happiness and pride? You shouldn't depend on other people to make you happy, maybe you will need them for enjoyment, but not to make you whole. We must learn to tune out other voices when you are trying to improve your inner self. Trust in who you are! That inner you needs as much attention as your outer shell and your mind in order to grow the person you can truly be. Your inner self is your GPS of life, the instrument that will keep you going in the correct direction when set in the proper mode. This setting is going to help you grow your strength and fulfill all parts of yourself. You can look fantastic and fit but have no guidance in your life. You could be the smartest person around but still feel unsatisfied and weak, Why is that?? Look inside and see what you have done for your inner you, lately. Have you been taking care of your inner self like you do with the shell that people can see and gives compliments on? Are you feeding the inner you with the nourishment it needs to grow and makes you feel terrific? What you empower inside will reflect brightly on the outside. Beauty only lives within your soul and then gets transferred to your mind. From there it will light up the world on the outside. Are you thinking that if you take care of everything on the outside that the inner you will grow? No, it doesn't work that way. You must empower yourself with strength, love, confidence and happiness on the inside, constantly. Once that is created no one can take that away from you, not even time. The outer shell will go through changes in time. Appearances changes, figures begin to change with age and the skin start to reflect time. The strength inside, if feed correctly, will be stronger than ever. Your beauty, strength and confidence won't change. You will be brighter than ever in life. Once you continue to grow the inside it gets stronger and better with age. The thing that keeps you young minded is what you empower and grow on the inside. What's inside doesn't change it will continue to grow and improve. When your strength comes from the inside you are able to survive life's ups and downs with grace and still stay strong and confident. The only thing you will depend on is your strength. By empowering your inner self you will always be strong, beautiful and full of life. Empowering your inner self helps you build and maintain a strong foundation, the bases of life. Everyone says that the eyes are the window to the soul, make sure when someone looks in your eyes they see strength, beauty and an independently happy individual. Never forget who you are and always keep that GPS focus toward your future. We all have something to say throughout our lifetime and we need to be heard. To discover someone that listens to you, without criticizing your thoughts is a delight. The process of growing our thoughts and dreams are important and we grow them faster when we are able to express them to others. Expressing your thoughts to someone that actually takes the time to listen and guide you is a blessing. A listener will allow you to express what you desire and will provide guidance and direction to you. A listener is a special type of person who will be there to help you focus and keep you on track. A listener is that person that provides you with a shoulder to lean on and will help you up when you fall. We all need that person to trust our thoughts to and who will provide a helping hand, not a lecture. To lose the person that listens to you will make your world go deaf. No one to hear your dreams for the future. We all know plenty of people that are willing to tell you what to do, give you their opinion and tell you when you are doing something wrong. A listener will provide you with productive suggestions and allows you to make your own decisions. Listening is the ability to receive and interpret messages in the communication process. Listening is an art to all effective communication. Without the ability to listen effectively, messages are easily misunderstood. So, let us all see if we can improve our listening skills and learn to listen better to others. As we age in life the one thing everyone wishes to know is how they will be remembered. The most important thing in life is to live it and not worry about how things will be when you are no longer on this earth. Did you treat everyone as well as you should? Did you teach someone how to love and smile today? You will be remembered for the type of person you are and how you made people feel. Were you truthful and honest? 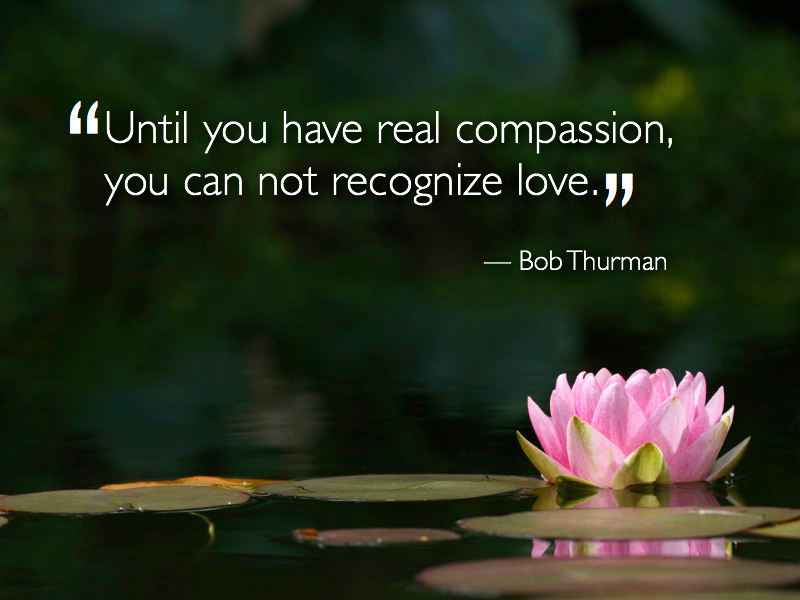 Were you a giving and loving individual? The secret for being remembered is sharing yourself with others, not just sexually but emotionally. Your graciousness, your caring, your giving of yourself, the unlimited amount of love you share with others, how you made them feel about themselves, remembering them in time of their uncertainty, is what everyone will remember about you. When you open yourself up to others and share who you are it may allow some people to take advantage of you. Sometimes you give and give and get nothing in return, but there are people out there who will offer you just as much or more assistance to you. Don't stop giving and sharing who you are; because being you is what makes the world a brighter place to be. Your are a star. It time to take a look at how you are living and if you are doing things in your life that will be remembered. Like having a smile on your face in times of unhappiness, being the happy person in times of sadness, giving love in times of being hurt, being strong. Trust the fact you are being your best and sharing the best part of life with others, yourself. You will be remembered for who you are and what you left. Live a worthwhile life with love and you will always be remembered. Don't make me a memory while I am still alive. As we travel through life and grow who we are, it becomes evident that when you walk alone you still get yourself where you wish to be but once you get there who do you share and tell your achievements to. Only you know what you have achieve and how hard your journey was to get there. Sharing your accomplishments helps others to grow with you. When you walk side by side with another, it makes the journey easier not less challenging. Friends walk together through a single path to help accomplished a goals for both of you or just to help your steps be lighter. Walk with me and we can establish our goals. Walk with me to discover the better part of the world. Walk with me to discover love and appreciation. Walk with me so we won't have to be alone. Walk with me so that we can enjoy each others company. Walk with me so we could laugh together. Walk with me too grow our feelings and become as one. The person that dances in the rain with you will most likely walk with you in the storm. Sometimes in our life we feel so exposed to the world as if we just removed all our clothes in order to feel a purpose. That exposure makes us vulnerable and open to hurt and disappointment. Dealing with that vulnerability makes us feel as if we are fighting an uphill battle, alone. Feeling naked allows us to see ourselves more clearly. Being naked strips away all of the pretending and hiding, it shows the real you. Seeing yourselves vulnerable helps us to choose a protected cover that will make you proud to display. Such as confidence, belief, love and independence for yourselves and hearing your own voice of life. Remember, you don't come into this world without the help of a another person, your mom, so reaching for a helping hand to help you get strong and move forward doesn't make you a weak person. Believe in yourself and the disappointments in life will be easier to identify and correct. When you have someone in your life that cares and loves you it will provide the cover and the companionship you would need. I believe that the worst thing in life is to walk through it in the dark. So many of us do this every day. You get up every morning and do the same thing blindly. Get dress and go to work in auto mode. Get through our days without a thought and return home. We function blindly through out our daily routine. One day you wake up and everything around you seems different. This requires you to participate with your eyes wide open. You don't get up and fix the same breakfast because your routine has now changed. You get dress and wear something totally different than what you would wear because you love feeling beautiful today. You go to work with a different frame of mind and notice that the challenge of the day isn't the job but the attitude you take, everyone is different. Your eyes are wide open. You must begin to recognized that life isn't just a four letter word to just exist in, but a word that means to live. It is never to late to wake up and begin to live. Sometime you wake up on your own and realize that you haven't been living or there is someone that offers a helping hand to show you a direction to awaken you. Whether it is you or someone that always knew the greatness inside you the results are the same, an awaken has began. I hope you awake to find a beautiful life and your heart continue to seek love. How many of you know what friendship means? By definition it is the emotion or conduct of friends. Being a friend is more of an emotional feeling because it is shared from the heart. What draws people together as friends is common interest; history of circumstances; common values and equality. A friend is someone who understands your past, believes in your future and accepts you just the way you are. True friends are very hard to find, difficult to leave, impossible to forget. True friends are not just there when it is convenient but when it is not. Time and distance does nothing to demolish the bond you have with those you call true friends. True friends are seen through the heart not through the eyes. A real friend walks into your life when the world walks out. Fake friends are like shadows, they follow you in the sun but leaves you when it is dark. A friend is with you through out your ups and downs, smiles and frowns. A person's true colors is shown when you are no longer beneficial to their life, which means they were not friends from the start. Friendship has countless value that just keep gaining value. Friendship means understanding not always agreeing. It means forgiveness not forgetting. It means the memories last, even if contact is lost. Friendship should never be taken for granted, because it is precious and powerful for the one you are sharing it with. The best things in the world cannot be seen or even touched, it must be felt with the heart and that is your feelings. Feelings for another individual sometimes can hurt you more than anything else, but hiding your feelings can be more hurtful. The more you hide your feelings the more they show. The more you deny your feelings the more they grow. Sometimes the idea of telling your feelings to someone terrifies you. Afraid they may not return the emotion or just laugh at the idea. The person who hides their feelings usually care a great deal about another individual. You hide your feelings because sometimes it may seem like no body cares. You are afraid to share your feelings because of the fear of getting hurt or rejected. A lot of the time what you don't say owns you and what you hide controls you. Never saying how you feel but always feeling the emotion will continually hurt and depress you. Emotions just happen, sometimes there is no reason or explanations why you have feelings for another person. We can't control who you care for. Waiting to tell someone how you feel may be to late, they might be gone or maybe moved on to another person. If you have feelings for someone you should let them know. Who knows you might make their day, if nothing else it will definitely make you feel good. Some of us are so afraid to ask someone for a helping hand. We treat it like a sign of weakness or disgrace to even think of excepting that help. Don't be shy about asking someone for help, it just shows that you area human being in need of assistance. Asking for help or assistance show an inner strength and truly shows you know yourself. Being strong enough to stand alone is fine, smart enough to know when you need help and brave enough to ask for it. A problem gets heavier when the only person carrying it is you. Whatever your worries are, it is better shared than not. Sometimes asking for help is the bravest move you can make. You don't have to go it alone. There are people that want to help you and allowing them to do that is a gift not a burden to them. But, you have to take the first step and open up to them. Having someone help you doesn't mean you have failed, It just means you are not alone. You are a strong person, but every now and then you also need someone to take your hand and say "everything will be Okay." To comfort you because you deserve it. Remind yourself that it's okay not to be perfect. "KINDNESS" is the language which the deaf can hear and the blind can see. Is love real or is it just a word! As we approach Valentine's Day we begin to think about feelings and emotions related to that word "LOVE". Love is an intense feeling of deep affection. A feeling of deep romantic or sexual attachment to someone. I believe that we all have felt or given love to someone; like the love for a child, a pet, or significant other, each on different levels. With the most romantic day approaching flowers shops, candy stores and stuff animals will be a big money maker. So, is this Love? Do you believe that the only way to show someone you love them, once a year, is through flowers and candy? Real love is not based on romance, candle light dinners, flowers, candy and walks along the beach. In fact, it is based on respect, compromised, care and trust. Real love doesn't care about body type, you looking like a model or wallet size. it only cares about what's inside. So, stop trying to squeeze into that size 2, caking on make-up to appear younger, stretching your face to get rid of those life lines, sucking in your gut in order not to show your love handles. Love is not complicated, people make it so. Sometimes one doesn't even know they are in love until it actually hits them in the face, because love happens slowly. You realize that you miss that friend a little more each day and all you want to do is share your day and nights with them. To comfort them from a long hard day, to wrap them in your arms and tell them everything is going to be alright, to be there when they need a hug, to make them feel special. Love is such an honest and compassionate emotion that only cost you a little time. Do you have the time to share your love? When you notice that the person you feel so open to, comfortable with and understands you is not there it makes you feel lonely and forgotten. You might not admit that it is love, because love is truly an emotion that doesn't get expressed or recognized a lot, but once it has been identified it makes one smile. True love doesn't have a happy ending because love doesn't end. It grows into the biggest, overwhelming emotion that you will ever experience. Love is just a word until someone gives it meaning. When you love someone they seem to consume your thoughts daily and nothing can ease those thoughts until you see or hear from them. When you love someone you don't just give up on them, you stand by them. Love is the most beautiful thing to experience, hardest thing to earn and the most painful thing to lose. It is very hard to let go of someone you love, especially when that love has grown from a friendship. Show your LOVE all year long because It is real!